We wine lovers live in a Golden Age. Not only are French, Italian and California wines better than ever, but new wines from new regions are constantly being discovered and brought to market. Australia, New Zealand China, Japan, India, Mexico Canada and Chile send shiploads of wine our way. Now, consider wines from Georgia. We’re talking here about the country in the Caucasus region of Eurasia, located at the crossroads of Western Asia and Eastern Europe, bounded to the west by the Black Sea, to the north by Russia, to the south by Turkey and Armenia, and to the southeast by Azerbaijan. Wine has been made in Georgia for over eight thousand years. For millennia, Georgian wine was renowned but after getting caught in the political turmoil of the Soviet Union, wine quality suffered. In 1991, Georgia gained its independence and began the long road back to reestablishing its fine wine industry. The Georgians are very spiritual about their wine and consider it a mystical beverage. Wine is always part of the country’s frequent feasting rituals that involves much sipping and elaborate contemplative toasts. And so it was with great anticipation that we headed to Downtown L.A. and Baco Mercat, Josef Centeno’s celebrated restaurant in the Old Bank district, a dim, close space. Centeno has been getting massive attention not only for being one of the driving forces behind Downtown L.A.’s recent renaissance but for the crunchy, paper-thin Catalan pizza called baco, a modern hybrid of a taco, a coca and a gyro, and for his many cocktails based on shrubs, a 19th-century concoction of fruit, sugar and vinegar. Drinking these wines was like nothing we had ever experienced. We are all the beneficiaries today. 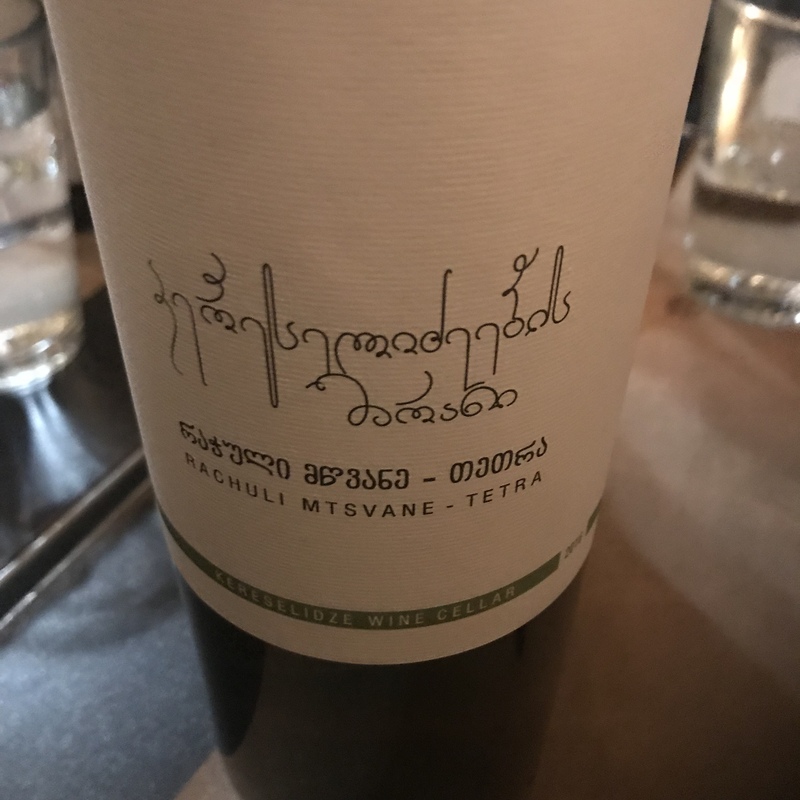 Among Georgia’s native varietals—there are over 500—the white grapes Rkatsiteli and Mtsvane yield wines of significant acidity, fruity aromatics and delicate flavors (these two are sometimes blended), and their red Saperavi produces deeply colored dramatic wines peppery, gamy, and full of wild berry not unlike syrah. Georgians even grow cabernet sauvignon grapes which they artfully mix with native grapes. We reveled in tasting these new flavors. The wines were distinctive, complex, balanced, and a total departure from European or California wines. Memorable were Saperavi from Gotsa Family Wines, a Rachuli Mtsvane-Tsitska from Kereselidze Wine Cellar, Orgo’s Mtsvane Brut sparkling wine, and a Rkatsiteli from Our Wine in Kakheti. 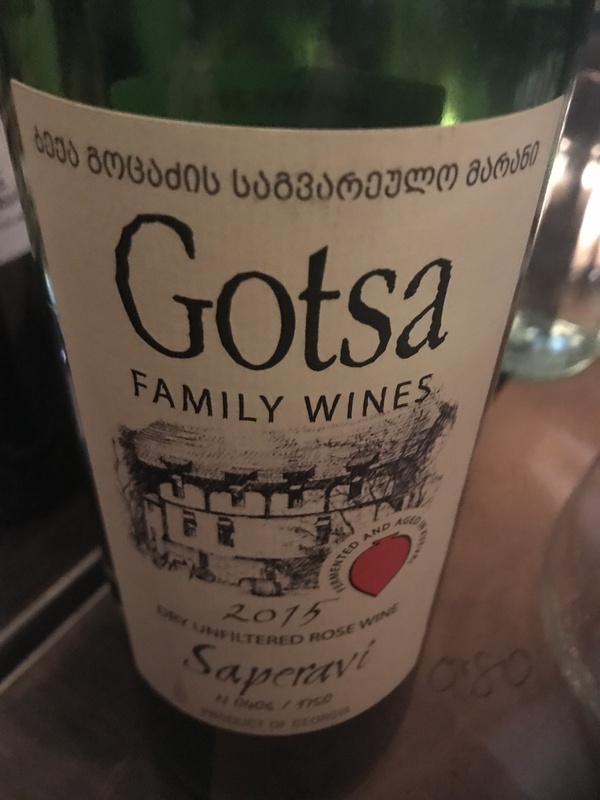 This was a delightful trip of discovery, made happier by the company of Georgians who had come to display their wines, proud and passionate about their wines, their authenticity and their bond with nature. Drinking these wines reminded us of the things that matter—love, friendship and generosity. Chef Centeno lived up to his hype by mounting a supra to remember, a feast of exotic salads, falafel, hummus, green beans, roasted cauliflower, spicy chicken, and whole fish, dishes that sang of garlic, walnuts, coriander, and pomegranates. Our feast was presided over by a tamada, a sort of spiritual leader and toastmaster who eloquently with quick witted sense of humor encouraged us to drink while we contemplated some of life’s more substantive issues. We left feeling we could feel Georgia–culturally, historically and aesthetically. Never underestimate the power of wine. These Georgian wines are rewarding and fascinating. Take a chance and try them; they are the pleasures that carried life forward and sustained a nation through its long and storied evolution since 6000 B.C.